This is a virtual shooting gallery from Spanish developer you play the role of a police officer, alone (except for the Star 30M service pistol fighting a very well-organized criminal gang. The gang controls at least an entire block, and skirmishes will have to be conducted with opponents entrenched in buildings. Armed to the teeth: in addition to small arms, they use grenade launchers and hand grenades; they do not disdain to hide behind hostages from among civilians, who, of course, should not be killed. Moreover, there are several types of opponents, and they are quite numerous, and in order to go to the next level, you need to kill them all. 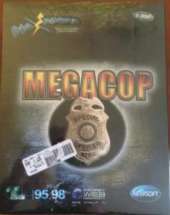 It plays in a small (640x480) window, with static backdrops and animated enemies, plus the only musical accompaniment is in the main menu - in general, all features of a budget game. The game is difficult - some gangsters shoot as soon as they appear on the screen, and you need to show a remarkable reaction to get ahead of them. In addition, the cartridges and life here are quite finite, although they can be replenished occasionally with bonuses.